Arsenal's former double-winning winger Luis Boa Morte has signed for Hampshire Premier League outfit Four Marks. Boa Morte, 36, is set to make his debut on Saturday for the side who are in the 11th tier of the football pyramid. The ex-Portuguese international won the double in 1997-98 and went on to have spells at Southampton, Fulham and West Ham - who paid £5m for his services. 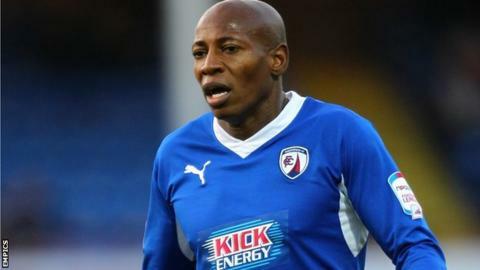 His last professional club in England was Chesterfield, for whom he played 13 times last season. Boa Morte started his English career with Arsenal in 1997 having been signed from Sporting Lisbon for £1.75m. He was then signed by Dave Jones at Southampton for £500,000, but his most prolific spell in English football was with Fulham, where he played over 200 times in two different spells, scoring 54 goals. He joined West Ham in January 2007 but left in 2011 to play abroad. Boa Morte moved to Greece to join current Wales manager Chris Coleman's Larissa FC, but left after just seven league appearances and moved on to South African side Orlando Pirates. He made his Chesterfield debut in October 2012 but left on 5 January. Four Marks play in the Hampshire Premier League but are currently bottom, having lost their opening two games.